You know that feeling, that rather delicious feeling when a book 'nags' away at you and begs you to return to it when you're not reading it. That. 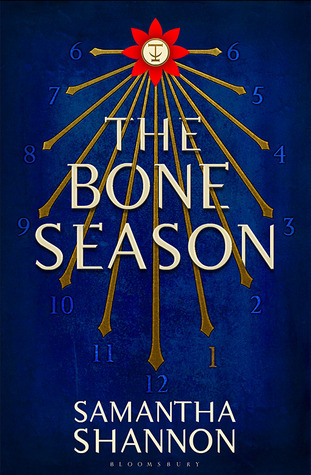 Samantha Shannon's "The Bone Season" is set in a twisted alternative future. It's 2059, and the world is a very different place to the world we know. Psychics are like currency, often actively subversive but more frequently press-ganged, corralled and drummed into service against a nefarious government known as "Scion" that would have them all destroyed on sight, and an alien race that are the true puppetmasters on this alternate Earth. One such psychic, 19 year old Paige Mahoney, finds herself immersed in the machinations of a criminal gang of talented psychics who have different specialities. Her own unique talents as a dreamwalker are of great value to the Mime Lord who controls the Seven Dials Gang, one Jaxon Hall. But when it comes to choosing sides, the lines are infinitely blurred so can Paige be sure of herself, and that she's doing the right thing? I'll say no more other than to urge you to seek out this book. Samantha Shannon's debut is just the first part of an intended 7-book series (Seven!) For a young author to tie herself to such a commitment is nothing short of astonishing, but the world Sam has created - and the fabulous characters therein can stand up to a long haul, so I seriously cannot wait to see how more pieces of the puzzle slot together in Book Two. As well as the enigmatic and charismatic Paige, Jaxon Hall is just the sort of bombastic ne'er do well that you'd want in a novel to offer a pivot point but the true villain of the piece, the insidious yellow-eyed alien known as "Warden" who holds court over a ruined Oxford, now turned into a hellish prison for psychics, is akin to President Stone in "The Hunger Games" - with very similar tastes in physical and psychic torture. I'm slightly baffled by some of the press surrounding the book, making comparisons between Samantha Shannon and J.K Rowling. The books couldn't be further apart in subject and tone, and aside from the fairly heavy commitment of a long book series - and the fact that they're both female and writing what seems to be coined as 'Young Adult' fiction (when really this is a novel that can be enjoyed right across a range of ages) there's no detectable similarity between the two. If anything, it'd be easy to compare "The Bone Season" to Phillip Pullman's "His Dark Materials" series - set in a similarly dystopian yet eerily familiar Oxford but again the comparison would be fairly weak if purely based on each book's setting (again wildly different). For someone who lives in Oxford and has direct links to academia I rather enjoyed Sam's gentle allegorical hints and digs in the book, and the familiarity of her described alt-universe that still has hooks into the ground-in patina of tradition and an almost stifling overbearing weight of 'knowledge as power'. As I said at the beginning of the review, this is a book that'll grip you and keep you reading into the wee small hours - then dash you on the rocks at the end in preparation for book two. 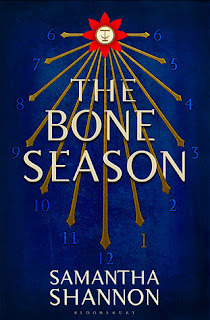 Be ready, Samantha Shannon and "The Bone Season" are going to be huge and the book's already been picked up by Andy Serkis' "Imaginarium" company for film options, so it probably won't be long before it hits the silver screen too.